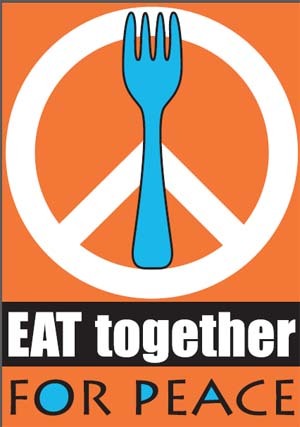 In anticipation of the International Day of Peace on Sept. 21, as well as the Dalai Lama’s visit to campus on Oct. 8-9, the Syracuse University Humanities Center is presenting Eat Together for Peace (ET4Peace), a weeklong program of food, arts and culture that is an invitation to take peacemaking personally. All events are free and open to the public and are an extension of the Perpetual Peace Project (PPP), organized and presented by the SU Humanities Center in The College of Arts and Sciences. For more information about ET4Peace, call 315-443-5708, or visit syracusehumanities.org. For Twitter and Facebook coverage, visit @ET4Peace and facebook.com/ET4Peace, respectively. ET4Peace grew out of conversations between SU Humanities Center Founding Director Gregg Lambert and community organizer Marnie Blount-Gowan, the latter of whom was inspired by PPP and proposed launching an initiative to benefit the campus community. ET4Peace, she says, encourages students, faculty and staff to eat with people who are different from themselves in some way. “ET4Peace is designed to foster peace and understanding. It speaks to the commonality of our human existence,” says Blount-Gowan, adding that the “menu” of events culminates with the International Day of Peace on the Kenneth A. Shaw Quad, where people are invited to form a “living” peace sign and then observe a minute of silence. Lead-off event for the Ray Smith symposia “Moving Borders” and “Positions of Dissent,” featuring community panel discussion, music, art and food. Members of the local Congolese community convey their experiences through words, music and images. Includes a Q-and-A, reception and an ET4Peace exhibition by illustration majors in the College of Visual and Performing Arts. The Department of Languages, Literatures and Linguistics (LLL) serves up international food, arts and culture. Lambert moderates a panel discussion featuring Catherine Bertini, professor of practice in public administration and international affairs at the Maxwell School and former executive director of the United Nations World Food Program; and Tula Goenka, associate professor of television-radio-film in the Newhouse School and co-director of the South Asia Center.